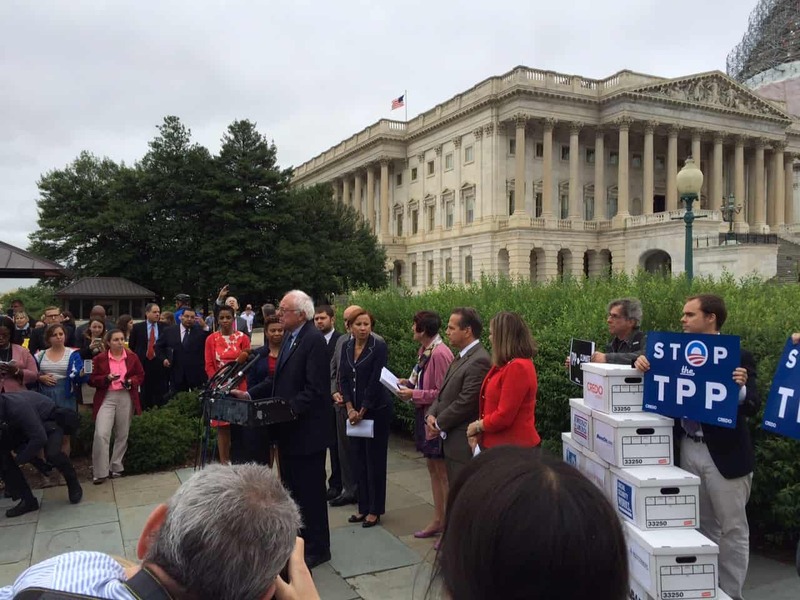 Sen. Bernie Sanders (I-Vt.) speaks in front of the Capitol at a rally June 3 against fast-track authority for the Trans-Pacific Partnership. Behind him are boxes containing 2 million petition signatures from organizations opposing the legislation. Congress felt the pressure today from millions of Americans opposed to fast-track trade authority for the Trans-Pacific Partnership. A coalition of organizations opposing the fast-track legislation presented members of the House of Representatives today with boxes containing 2 million signatures of people calling for the House to vote “no.” Meanwhile, the Campaign for America’s Future and dozens of other progressive organizations were urging their members to flood congressional offices with calls today – and they did. “Our phones are ringing off the hook,” said Rep. Rosa DeLauro (D-Conn.), at a press event in front of the Capitol. She said that resistance to the deal is growing as Americans become increasingly aware of the disaster that is the TPP. “If there were ever a day to stand up for the American worker, and not for corporate greed, today is that day, and TPP is that issue,” said Sen. Bernie Sanders (I-Vt.), who also appeared at the event with several other progressive lawmakers. The specifics of what’s in the TPP are largely unknown, thanks to a secretive negotiations process. What is known, however, is that corporate lobbyists have had more access to the substance of the discussions than even our elected representatives have had, who are only allowed to read the text under highly restrictive circumstances, and are legally obligated not to share what they have read. Fast-tracking the deal through Congress would be the final step in allowing this affront to the democratic process to succeed. Ultimately, from what few details are known, it’s clear that this treaty serves the interests of multinational corporations at the expense American workers. One provision, for example, would allow corporations to sue governments in an independent court, often staffed by corporate lawyers, over policies that they argue would hurt their profits. Such a system could cost the United States billions of dollars in fines, in addition to potentially undermining important environmental and consumer safeguards. This is not what our democracy should look like.